I have continued with WIP Sunday today, however rather than work on a sock as had previously planned, I worked on something more recent. 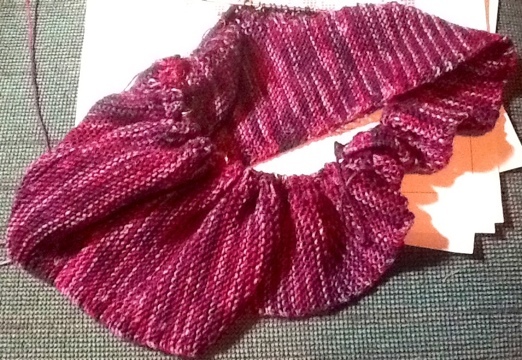 The Janel Laidman mystery shawl. I started it a couple of weeks ago when the first clue was released. I set it down to work on my other things and it was a bit boring. I knit a massive ton today. It feels like a million rows of garter stitch. I could count them, but I’m over it now. Anyway there’s these loops that require picking up, 290 of them to be exact. After picking these up a lace section starts. I’m on row 3 of that section. These are REALLY long rows. It might take me a bit to finish this one. 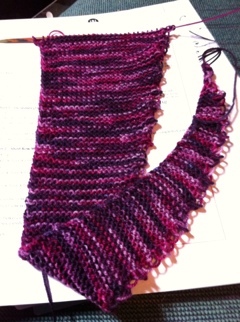 A new cowl KAL is supposed to start on the 8th though. The color in the first one is more accurate.